In marketing, sometimes the best results come from taking an established technique and applying it in a new way. 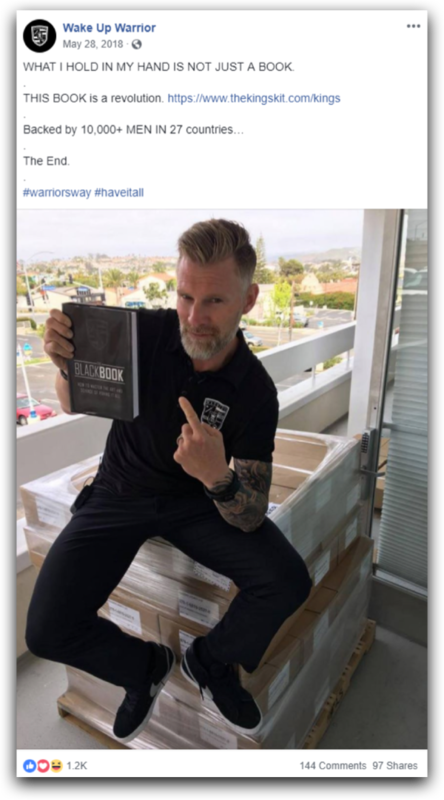 And in this case study, we took our tried-and-true eCommerce ad strategies and applied them to an information product funnel to sell books and an online membership program. The results were dramatic: our client went from losing money on Facebook to earning a tidy profit and achieving big success on a brand-new membership launch. Read on to find out what we did to create such a drastic improvement in their results. When Wake Up Warrior came to us, right off the bat we could tell that their targeting was very basic. Their ads were unfocused, and in particular they were not using lookalike audiences to their full potential. Their success with this strategy was mixed. On one hand, they did manage to achieve good branding, sell a lot of books, and generate a lot of social proof and unsolicited testimonials. On other hand, they had a high cost per acquisition (CPA). They were spending more than $100 to sell each $100 book, which meant they were losing money on each sale and relying on event registrations to break even. So Wake Up Warrior charged us with getting their account back online and improving their results. 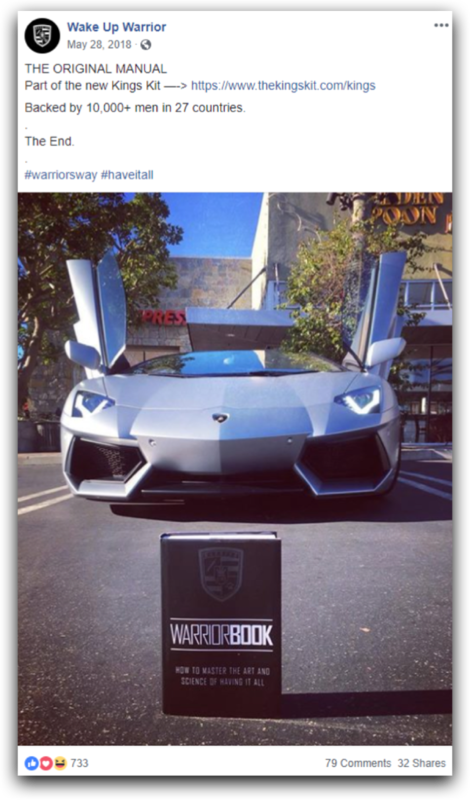 The goal was to eventually profitably scale their ads to the $250k-$500k/month range. 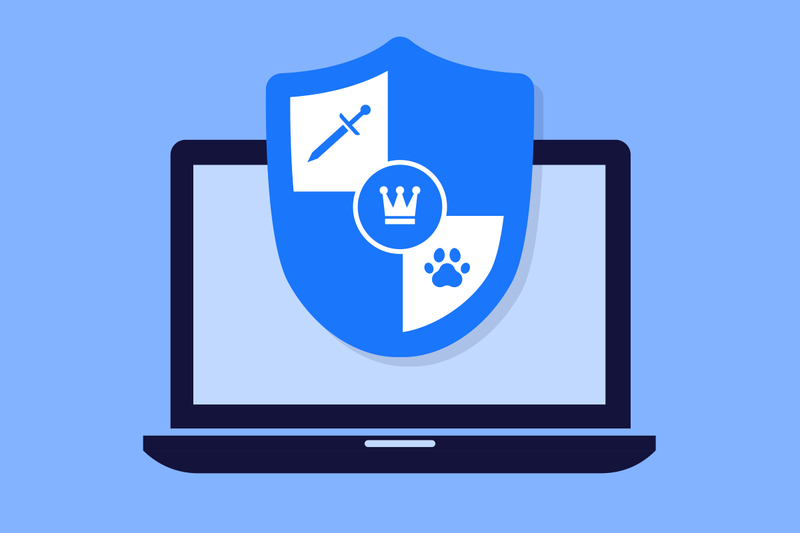 Thanks to our extensive experience with Facebook (not to mention access to our own Facebook Partner Manager), we were able to resolve their compliance issues and get them back up and running on Facebook. Next we had to find out how to scale their campaigns while reversing their ROAS (return on ad spend) from losing money on each sale to earning a profit. Making this even more difficult was the fact that we were working with a brand-new, untested marketing funnel, which meant that we had no previous data to guide us. The new funnel involved selling the same $100 book up-front, and including a free one-month trial to their new membership site. Anyone who stuck around after that was entered into a $500/month membership program. 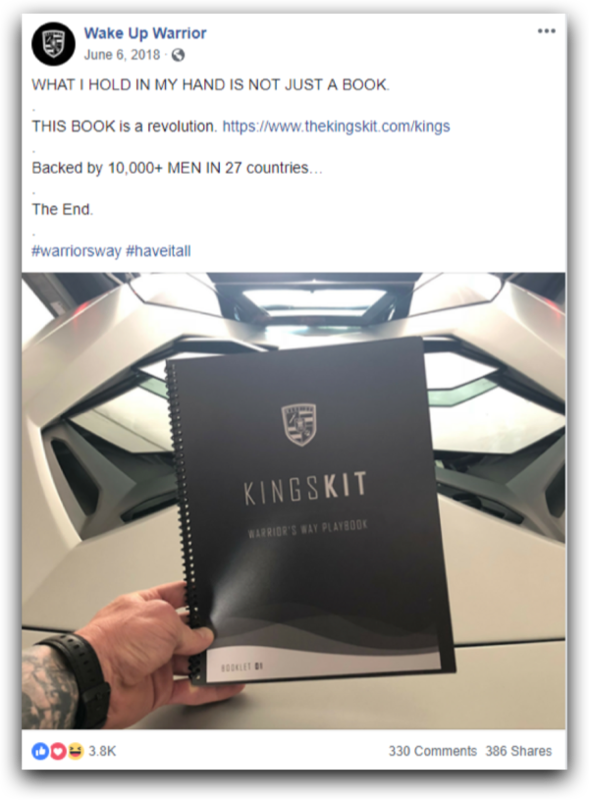 It was a promising funnel, but at this point everything about it was unproven (except for the initial book, which they had not been able to sell at a profit). 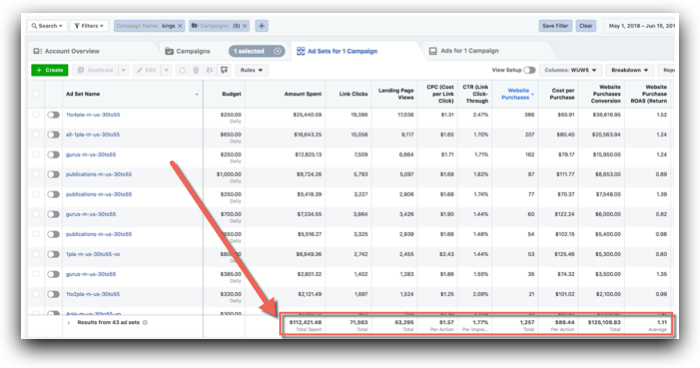 This meant it was up to us to create a Facebook ads strategy that would help launch this new funnel successfully. 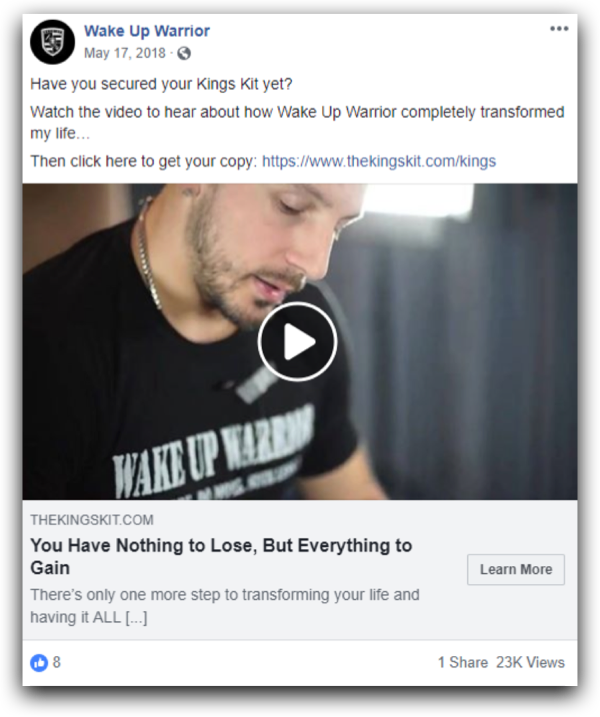 Previously, Wake Up Warrior had never targeted their audience based on a specific spot in the marketing funnel—which meant that everyone saw relatively generic ads. 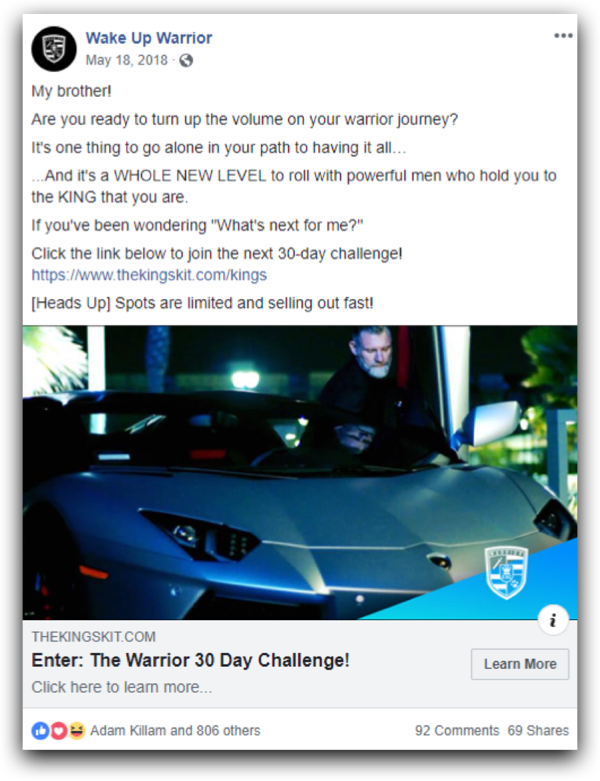 The first thing we did was implement The eCommerce Ad Amplifier™, the Facebook ads strategy we use to target prospects along the marketing funnel with specific messaging. Using this system, we can systematically work users down the marketing funnel based on touch points and exclusions from higher funnel levels. It allows us to be more targeted in our ads and more specific in our calls to action. Normally, with eCommerce companies we begin by targeting lower Levels (such as Levels 3-4). But in this case we couldn’t do that, because it was a brand-new funnel—which meant there was no one in traffic levels 2-5. So we were forced to build out the funnel as we went along, starting with Level 1: Cold Traffic. Cold traffic refers to anyone who hasn’t heard about your company or your brand before. And when you’re targeting these people on Facebook or Instagram, you need the ad to accomplish a couple things. First and foremost, it needs to be visually arresting—it needs to catch that person’s eye and get them to stop scrolling and pay attention. Second, it helps if your ad makes a strong impression. This is important because even if the ad doesn’t succeed in generating a purchase right away, it will still be effective at generating greater brand and product awareness. And if you can achieve that, it will make the rest of your ads that much more effective because people will remember you. Notice that the copy, while short, manages to create some intrigue and curiosity. The book isn’t just a book—it’s a revolution. It’s not explained in the ad. Instead, you need to click through to the landing page to learn more about this mysterious book. Level 1 traffic will usually have your lowest ROAS. This is expected, since you’re serving ads to people who are just hearing about you for the first time. This means we also improved their ROAS from less than 1 to 1.11. The next step in The eCommerce Ad Amplifier™ is remarketing to people who have engaged with you on Facebook. This could include people who watched your video ad, commented on an ad, viewed your Facebook page, became a fan, etc. Since these people are still relatively new to the brand, the ads are often similar to the Level 1 ads. But if nothing else, we like to switch up the copy and/or the image so they see something a little bit different. Because Level 2 ads are displayed to a more engaged audience, you would expect them to convert more effectively than Level 1—and that was certainly the case here. Now we move on to the next level of engagement, which includes people who have viewed a product page (Level 3) or added a product to their cart (Level 4). Level 3 and 4 traffic often converts very well. These are people who have demonstrated a strong interest in your product by checking out the landing page and even beginning the checkout process. For that reason, it pays to put some extra effort into these ads. With Wake Up Warrior, here’s where we started leveraging video testimonials. Video testimonials can be some of the highest-converting assets on Facebook, so if you haven’t tested them, it’s well worth your time to record a few. Level 5 ads are displayed to your most engaged audience members: your existing customers. You can do a lot of different things with these ads, such as giving restock reminders (for products that need to be rebought or replenished regularly, like supplements) or promoting cross-sells or new product releases. In this case, we didn’t have a new product to offer Wake Up Warrior’s previous buyers. But we were still able to leverage Level 5 traffic by running page post engagement ads. The goal here was to encourage their previous purchasers to weigh in on the ads with social proof. This way, we were able to overwhelm any negative reactions with even more positive comments from their Warrior members. 1) They converted with a 1.72 ROAS, similar to their Level 2 traffic. 2) They improved the conversion rates of Level 1-4 ads by generating more social proof in the form of likes, shares, and positive comments. We spent only a little over $1,000 on these ads, but the spend proved to be highly profitable for their overall campaign results. What Were the Overall Results? Recall that Wake Up Warrior originally had a CPA over $100. After we implemented The eCommerce Ad Amplifier™, we were able to generate over 2,000 purchases and reduce that CPA by more than 30%, taking their CPA from $100+ down to just over $71. This meant that instead of losing money on every book sold, they generated $29 in positive revenue. All in all, we improved their ROAS to 1.38—which meant that for every $1 they spent, we generated $1.38 in revenue. And that’s just their return on book sales. It doesn’t even include the recurring monthly revenue they made from the $500/month membership program on the back end! Not bad for a brand-new, untested marketing funnel. 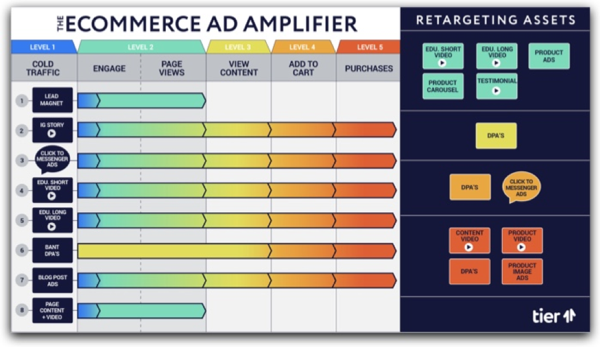 You’ll notice that the ROAS is lowest at Level 1 (cold traffic), and increases significantly as we move farther up in The eComm Ad Amplifier™. This is fairly typical, which makes a lot of sense when you realize that each Level represents a higher degree of engagement with the campaign. 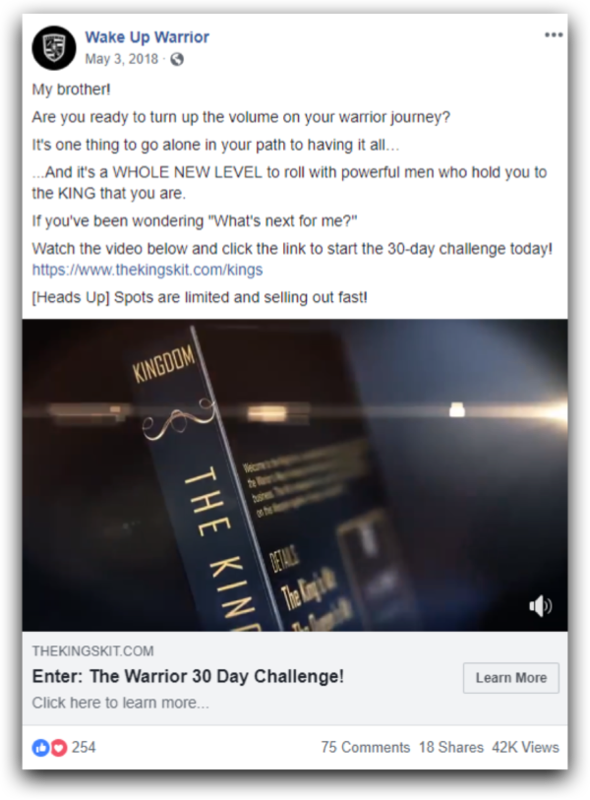 Our campaigns also had a 30% membership conversion rate, which meant Wake Up Warrior was able to generate significant recurring revenue and get a lot of new members in this program. At the end of the day, we were able to celebrate a successful launch for a funnel that had little to no testing. It’s fair to say we were all excited about the results. But that’s not to say we can’t do better next time. We always aim to improve our strategies and processes moving forward, and often this means pinpointing the things that didn’t work so well. In this case, the biggest learning didn’t come on our end. 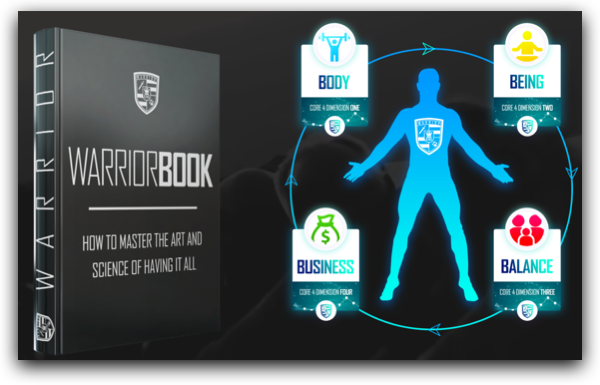 Because of the 30% membership conversion rate, Wake Up Warrior got a lot of people into their new membership program, fast. This was great for recurring revenue, but their team soon realized that this new membership program was very labor-intensive to maintain. Eventually it became too much work to sustain, so they canned it. It’s not the end of their Facebook advertising, though. This campaign helped to open their eyes to what’s possible on this platform, and we’re already hard at work with them on their next big project. 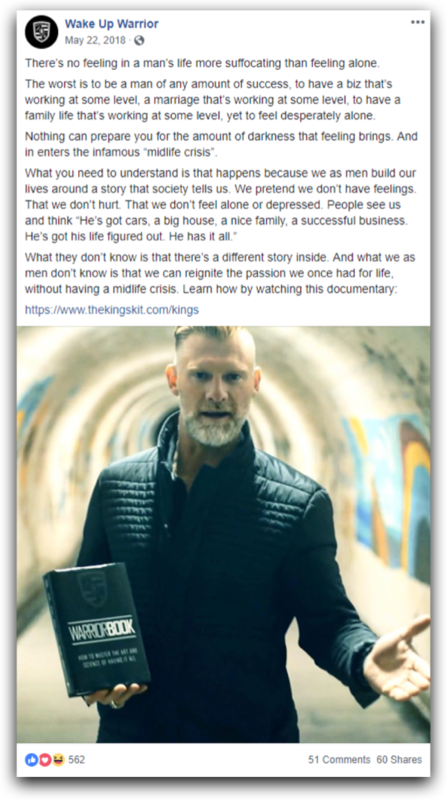 If there’s one big takeaway from this case study, it’s that using eCommerce strategies to promote information products can be extremely powerful. This is true because all products involve a buying process. This is the series of steps that your prospects go through as they gradually become more aware of, and interested in, whatever it is you sell. And the great thing about The eCommerce Ad Amplifier™ is that no matter what it is you sell—an eCommerce product, an information product, or even a service—this system is flexible and modular enough to target your prospects along every step of that journey. So that you can create an ad campaign that leads them every step of the way, from first impression to final sale. If you’d like to get help leveraging The eCommerce Ad Amplifier™ to improve the results in your campaigns, talk with us. We can’t wait to help make your next launch a huge success.